ComNext is an independent communication consulting agency specialized in tools for your sales force. Our mission : To listen to your needs, understand your challenges, explore new territory, push boundaries and offer you a new approach to communication for your advertising campaigns, print or digital materials, video productions and media plans. We have all the skills to provide unique solutions for you, all the way from strategy design to project implementation. Visit us at comnext.com for more information. 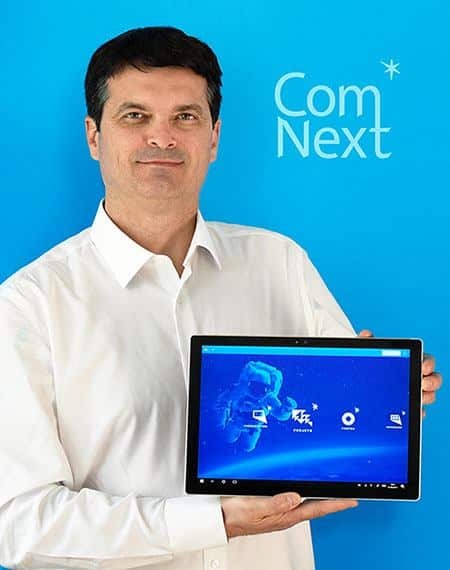 Four years ago, ComNext began focusing on applications for tablets. We are one of the top Touch & Sell Premium Resellers in terms of the number of customers as well as licenses deployed. Bernard Controls, Cafés Richard, Canal+Régie, Daher, Ottobock, Sofrigam and Thales all worked with us to implement their applications. We create solutions that salespeople actually use in the field, solutions that make their lives easier. Touch & Sell can host your company’s entire marketing book. We optimize the graphic design and tree so that it can be intuitively accessed, all while maintaining your company’s visual identity. This puts all your salespeople’s presentation tools within easy reach.